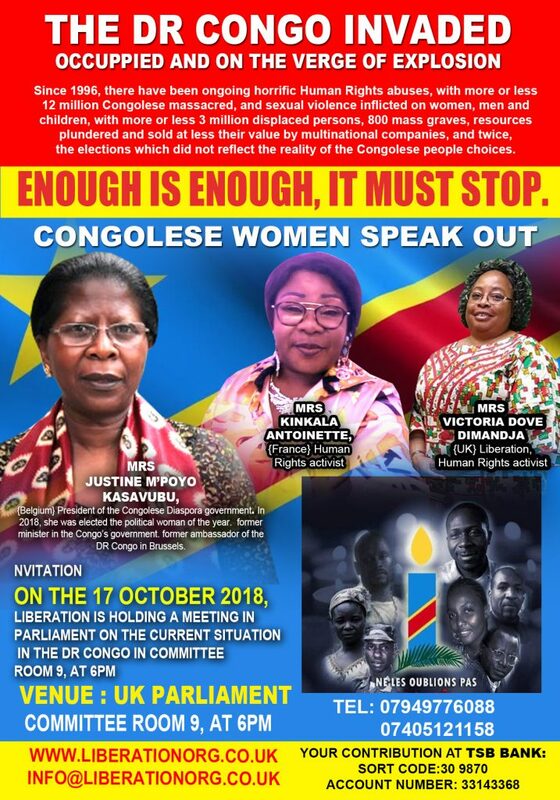 Liberation is hosting a meeting in Parliament on the situation in Democratic Republic of Congo on the 17th of October 2018. Join us to discuss the elections which did not reflect the reality of the Congolese people choices and the ongoing horrific Human Rights abuses and sexual violence inflicted on women, men, and children. The recent history of DR Congo is one of aggression, war and corruption, and has been at the centre of what some observers call “Africa’s world war”, with widespread civilian suffering. Victoria Dove Dimandja – a member of Liberation and Human Rights activist. Justine M’poyo Kasavubu – (Belgium) President of the Congolese Diaspora Government. Kinkala Antoinette – (France) Human Rights activist.